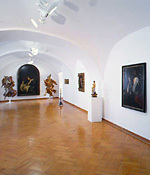 The Northern Bohemian Gallery of the Fine Arts opened in 1958 and is accordingly one of the first galleries to have been founded in the Czech Republic. 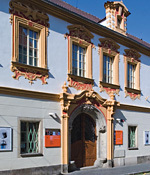 The gallery’s chief holdings are presented in tasteful contemporary manner in a historical town house directly on the marketplace: the collection of Old Masters of the fourteenth to sixteenth centuries, the collection of Baroque art, and artworks of the nineteenth and twentieth centuries. Artistic monuments from the region of Litoměřice and north-western Bohemia constitute the primary focus of the permanent exhibition. 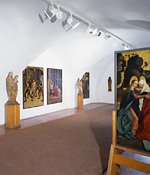 Among the highlights are a wooden sculpture of the second half of the thirteenth century with its original polychromy, and six panels of the years 1500/1505 by the Master of the Litoměřice Altarpiece. By crossing the courtyard, visitors can access the castle moat, which is used as an open-air sculpture garden. In 2005 it was redesigned as a “new architecture space”.